Dining at Texas Roadhouse is truly an experience, since you get food and live entertainment all in one place! Whenever certain songs start playing, the staff will stop what they’re doing and start dancing in the middle of the restaurant. 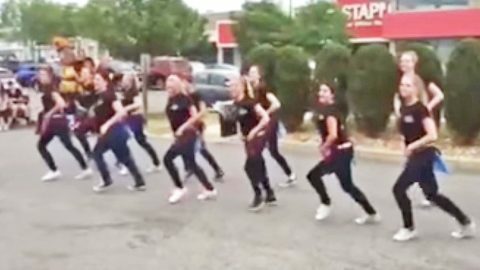 Since Texas Roadhouse workers have become so well-known for their dancing skills, the restaurant chain actually hosts line dancing competitions. The team of employees at the Texas Roadhouse in Worcester, Massachusetts are often the stars of the competitions they take part in, and have won on a number of occasions. Originally released by rock artist Kenny Loggins in 1984, “Footloose” served as the main track on the soundtrack to the film of the same name. It reached the top spot on the Billboard Hot 100 and held on to its standing for three weeks. When the film was remade in 2011, its soundtrack had more of a country music influence. That was due in large part to Shelton’s recording of “Footloose,” which charted on both the country and pop charts after its release. Anyone who has heard Shelton’s version of “Footloose” knows that it’s a song begging to be danced to. So it’s no surprise why the Worcester Texas Roadhouse workers decided to make a line dance to go along with it! The song isn’t slow by any means, so any dance that pairs with it has to be pretty fast. But the Texas Roadhouse workers had no trouble keeping up with the routine they created, which included a fun series of kicks, turns, claps, and other moves. Watching this dance, it’s no wonder why the Worcester team danced away as the winners of the competition. You can tune in below to see the action unfold! Will you give this dance a try later? We’d love to!